Deeney was dismissed in the 11th minute on Monday night after catching Torreira with his elbow, seconds after Watford had gone behind in their 1-0 defeat. The striker was shocked to have been sent off, with the red card given after Pawson was informed by his assistant referee, and he made his displeasure very vocal. With the game broadcast live on Sky, Deeney was captured by the television asking Pawson ‘what for?’ after being given the red card. After being told it was the assistant who made the call, Deeney can be seen asking the official ‘how?‘, before being told to leave the field again by Pawson. Deeney then told Pawson the decision is ‘f****** embarrassing‘ before walking off. The former Walsall man pulled off his shirt in disgust and flung his captain’s armband towards a team-mate before making his way towards the dugout. As he left the field, he got involved in a heated discussion with Torreira. Although Deeney’s back is to the camera during his exchange with the Uruguayan, as he turns to leave the striker clearly calls Torreira a ‘f****** p***y’. Arsenal won the game thanks to Pierre-Emerick Aubameyang’s goal seconds before Deeney’s red card, scored after he charged down Watford goalkeeper Ben Foster as he dallied over a clearance. Hornets striker Deeney infamously claimed Arsenal ‘lacked cojones‘ last season after Watford beat Arsenal 2-1, adding to the amusement of the away fans when the 30-year-old was given his marching orders. 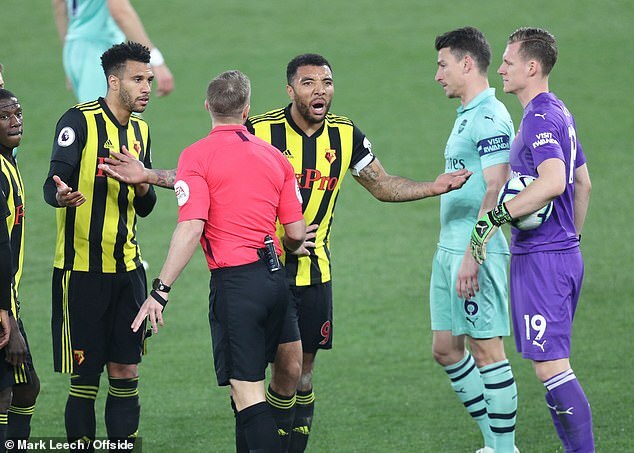 Speaking after that win in 2017, Deeney said Watford’s physicality meant they overcame Arsene Wenger’s side to win 2-1 in a Premier League match. ‘There’s a reason why they lost and it wasn’t because of one penalty,’ Deeney said. ‘I’ll have to watch what I say. It’s (having) a bit of cojones, a bit of nuts. Whenever I play Arsenal, I’ll go up and think, “Let me whack the first one and see who wants it“‘. He said: ‘The linesman has got a great view of it. I think 15 years ago, he’s not done a lot wrong. Now, he’s got nowhere to go. Hornets boss Javi Gracia felt Deeney should have been booked: ‘I respect the referee’s decision, but I don’t agree. In my opinion, it is a yellow card but never a red.